The HL-5370DW is a flexible, high-performance solution for printer sharing in small offices. Offering the same print speed, input capacity and duplex printing capability as the HL-5340D, the HL-5370DW also features outstanding connectivity with its built-in wireless 802.11b/g and Ethernet network interfaces, as well as 32MB of memory. Flexible networking. Built-in wireless 802.11b/g and Ethernet network interfaces allow you to share this printer with multiple users on your network. Eliminate extra cables and conveniently place your printer with wireless networking. Easily print two-sided documents. Produce professional looking documents, brochures, and booklets using the built-in duplex feature. This feature can help save money and reduce your paper use. Fast results. 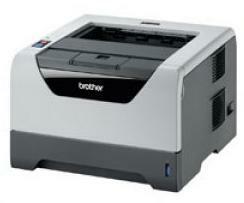 Operating at print speeds of up to 32 pages per minute, this printer is ideal for busy offices. Outstanding print quality. Delivering up to 1200 x 1200 dpi resolution, all of your printed materials will look their best. Versatile paper handling. An adjustable 250-sheet capacity paper tray easily handles letter or legal size paper and a 50-sheet capacity multi-purpose tray is for printing letterhead and custom paper sizes. Add up to two optional paper trays for additional capacity. Straight-Through Paper Path. A convenient fold-down, 50-sheet capacity multi-purpose tray and rear paper exit provide a straight-through paper path for printing envelopes, thicker media and custom paper sizes. Easy to set up and use. For users with wireless access points that support SecureEasySetup, Wi-Fi Protected Setup, or AOSS, you can automatically configure your wireless settings by simply pressing a button on your router.